A Graphic Guide to Writing SMART as Hell Goals follows Mickey, a new employee, on his journey from SMART to SMART as Hell. In this fast paced comic book by award-winning author Glenn Hughes, you’ll watch Mickey rebound from a failed meeting with his boss Amy, by getting clarity around his goals and actions. Written for any one who writes or receives goals, Mickey’s story will benefit employees, leaders, managers, trainers, teachers, coaches, and HR professionals. 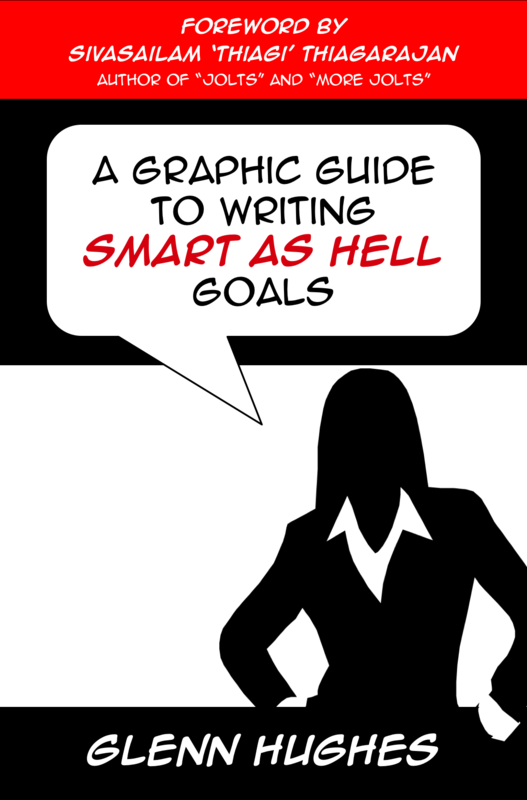 A Graphic Guide to Writing SMART as Hell Goals is packed with tools, tips, and techniques for driving action, alignment, and achievement. Identify whether a goal is Aggressively S.E.T. Foreword by interactive learning guru Sivasailam ‘Thiagi’ Thiagarajan. – Brent Bloom, Vice-President, Applied Materials Inc.